Employees of HUAWEI Mobile Philippines and Ogilvy and Mather Philippines., hereinafter the “Organizers of the Promotion”, and other official media partners and sponsors and their relatives up to the fourth degree of consanguinity and affinity are disqualified from joining. Participant must be fans of the HUAWEI Mobile PH Facebook Page (https://www.facebook.com/HuaweimobilePH/). The promotion period is from 07 May – 10 May 2018 only. To join, participants must be fans of the HUAWEI Mobile PH Facebook page. Only one entry per user will be accepted for the duration of the promotion. One submission of the entry per week / challenge will constitute one (1) valid entry. A participant can only qualify once per week / challenge during the entire duration of the promotion. A participant can qualify a total of three times during the entire duration of the promotion. One valid entry per week / challenge. 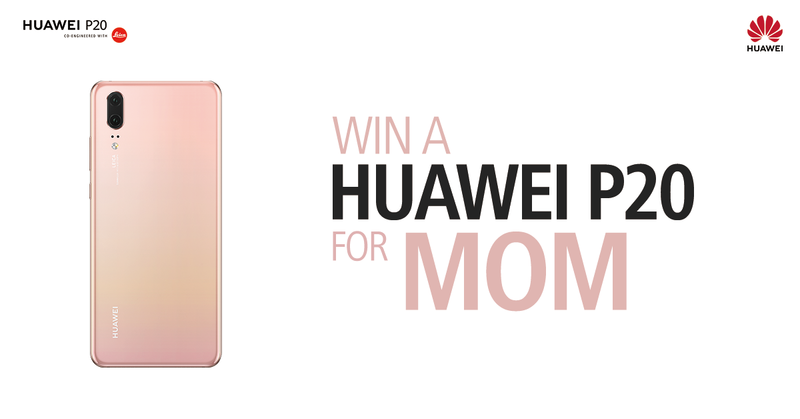 The winner will be sent a private message on Facebook or registered mail to confirm that he / she is a winner of a HUAWEI P20 phone. The winner must provide proof for their entry to be considered verified. All of the following documents must be presented when claiming prize: valid ID (government issued ID, school ID or company ID valid within the last six months). Share a photo of you and your Mom and share with us your favorite moment together. Register and upload the entry. Click share to post on the participant’s Facebook page with the pre-designed HUAWEI frame. The participant with the highest number of likes and shares shall be used as the benchmark for the 40%. The prizes at stake is one (1) HUAWEI P20. All prizes are transferrable but not convertible to cash. Winners shall be notified through a Facebook message and registered mail. For GMA participants, the prizes shall be claimed at 14F 8 Rockwell Hidalgo Drive, Makati City. For non-GMA participants, the prizes will be delivered to the winner’s address as provided in his / her response to the private message. The prize may also be claimed by the winners’ duly authorized representative, who, aside from submitting all the documents enumerated above, must also present a written authorization designating him / her as such duly authorized representative. Failure to present any of the foregoing requirements shall disqualify the Winner or his / her representative from claiming the prize. During the delivery, if the winner or the authorized representative is not present to receive the prize, the courier will attempt to deliver the prize again. If neither one of them are present to receive the prize during the second delivery, no attempt will be made to deliver the prize for the third time. In this case, the prize can only be claimed personally by the winner or his or her duly authorized representative at 14/F, Ogilvy & Mather, 8 Rockwell, Hidalgo Drive, Makati City, on a date scheduled and agreed upon with Organizers of the Promotion. The decision of the organizers of the promotions on this regard is final. Prizes not claimed within sixty (60 days) days after the receipt of notification of winners with prior approval of the Department of Trade and Industry shall be forfeited in favor of HUAWEI Mobile Philippines.